With just over two weeks to go to Referendum Day, please ask for a Miracle for Life and Faith! There are many powerful prayer (and fasting) efforts going on and many canvassing opportunities to seek to win hearts, minds and votes for Life. The 40 days and nights of Eucharistic Reparation is ongoing on Croagh Patrick, as is the 54 day Rosary for Life. Many groups are holding rosaries, Eucharistic adoration, vigils...public, parish and private. We are also fasting (bread & water only) for Life on the Fridays of May. In all, we remember that it is God who gives the victory. It is He who sees our efforts and hears our prayers offered through Our Mother Mary, through St Joseph, the Irish Saints, Holy Souls and angels ...and it is He who grants Miracles. 1.The Feast of Pentecost is coming and it is time to start a novena or triduum, starting on 11th May (we urge you to start the noveena irrespective of the delay in sending this mail), we ask you to pray for a great outpouring of the seven gifts of the Holy Spirit on the Voters, on ourselves and our families, on Ireland and on the Church. "Come Holy Spirit" Prayer. Come Holy Spirit, fill the hearts of your faithful and kindle in them the fire of your love. Enables us to judge correctly. 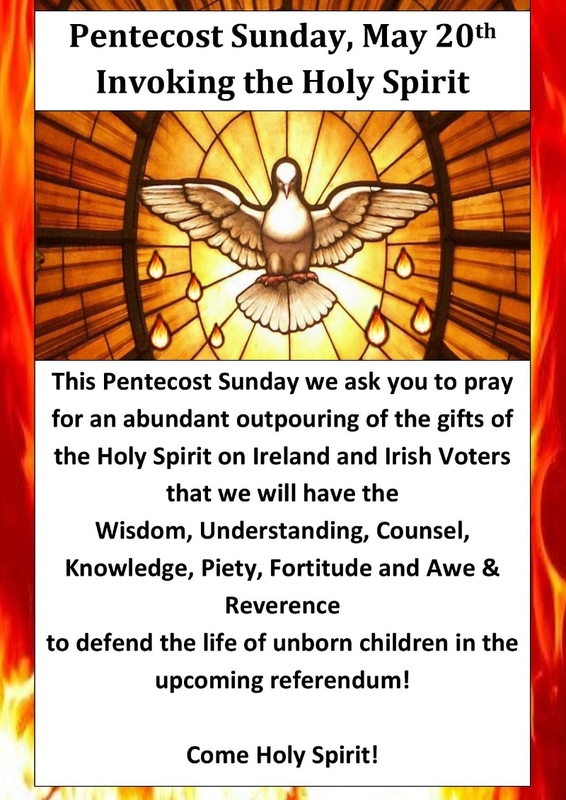 Come Holy Spirit on Ireland and its Voters! Gives us insight into the mysteries of faith so we may live by them. Light to guide us in practical matters. Gives us a Christ-like courage to love God in the face of all obstacles including death. The media have played an enormous role in conditioning many Irish people to accept the unacceptable...the killing of babies before birth. and consider switching from your usual news outlet to Front Page as it grows and expands. It is already becoming so effective that Facebook blocked Front Page on Tuesday the day after blocking pro-life ads. The Culture of Death is terrified of the beautiful Message of Life. We promise not to send too many emails but it is vital that the prayer warriors of Ireland are able to stay in touch. Archbishop Eamonn Martin, Primate of ALL IRELAND is joining us in prayer from Our Lady's Shrine at Lourdes on the Feast Day of Our Lady of Fatima this Sun 13th May to make reparation to God the Father on behalf of the Irish nation.